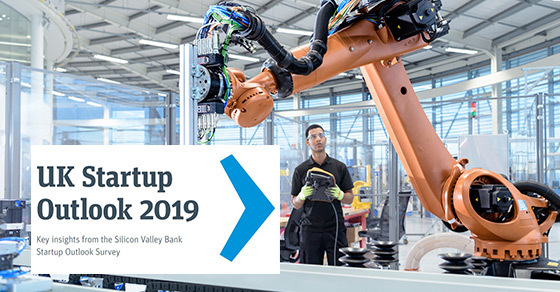 LONDON – 20 February 2019 – Silicon Valley Bank (SVB), the bank of the world’s most innovative businesses, enterprises and their investors, released the 10th anniversary edition of its Startup Outlook Report today. The report is based on a survey of 1,400 startup founders and executives primarily in the UK, the US, China and Canada. Startup Outlook reveals respondents’ thoughts on business conditions, funding, exits, hiring, workforce diversity and public policy issues, including Brexit and business relocation plans. Following are the key findings from the 2019 UK Startup Outlook Report. Most Startup Outlook 2019 respondents are founders or executives of companies with fewer than 25 employees and less than $25 million in annual revenue. Reports specific to the US, Canada and China are available here. Seventy-five percent of UK entrepreneurs say that in general Brexit, regardless of any specific exit plan, would have a negative effect on the UK innovation economy. Only 11 percent say that the post-Brexit environment would have a positive impact on the sector. With access to European markets a concern, 28 percent of UK startups plan to open a mainland European outpost. Still, the UK appears to be a vibrant centre of global innovation with more than half (55 percent) of startups saying that they do not plan to move their headquarters outside the UK. Forty-one percent of entrepreneurs expect business conditions to improve this year, compared to 49 percent in 2018. Twenty-two percent, up from 9 percent last year, of entrepreneurs believe that conditions will worsen in 2019. 81 percent of UK startups say that access to talent is the most important public policy issue they face. International trade (45 percent) and consumer privacy (42) percent rank next. One in three respondents also say that finding talent is extremely challenging. However, 81 percent of UK startups plan to expand their workforces in 2019 – down eight percentage points since 2017. Nearly 50 percent of startups have at least one woman on the board of directors. For the second year in a row, the percentage of startups with at least one woman in an executive position is nearly 60 percent. Three in four UK startups surveyed successfully raised capital last year, which underscores the healthy amount of domestic capital available for innovation companies. However, 75 percent say the current fundraising environment is either somewhat or extremely challenging. Their outlook for raising international capital is also dimming, as 44 percent believe that access to international capital will be more difficult in 2019. By a large margin, UK startups expect their next source of funding to come from venture capital (50 percent). There is also an increase over 2018 in the percentage of those who expect they will rely on organic growth (rising from 4 to 13 percent) or private equity (rising 3 to 10 percent) to satisfy funding needs. As in past years, acquisition remains the most likely long-term exit path (43 percent), but a growing number of UK startups say they expect to stay private, (rising from 17 percent a year ago to 24 percent. The percentage choosing IPO was steady at 22 percent. Eight in 10 startups think M&A activity will grow or remain about the same in 2019. AI, digital health and big data are the top areas that UK entrepreneurs say have the most promise in 2019. Looking ahead 10 years, they expect autonomous transportation and cleantech/energy innovation to replace big data and fintech in the top five. For additional survey data, including a closer look at hiring, fundraising and respondents’ views on public policy issues, please visit: https://www.svb.com/startup-outlook-report-2019/. UK survey data is based on responses from 108 UK technology and healthcare entrepreneurs. SVB will publish an in-depth report on Women in Technology Leadership in H1 2019. Follow the conversation on Twitter at @SVB_UK and @SVB_Financial with #StartupOutlook. ©2019 SVB Financial Group. All rights reserved. SVB, SVB FINANCIAL GROUP, SILICON VALLEY BANK, MAKE NEXT HAPPEN NOW and the chevron device are trademarks of SVB Financial Group, used under license. Silicon Valley Bank is a member of the FDIC and the Federal Reserve System. Silicon Valley Bank is the California bank subsidiary of SVB Financial Group (Nasdaq: SIVB).